Donald "Duck" Dunn (November 24, 1941 – May 13, 2012) was an American bass guitarist, session musician, record producer, and songwriter. Dunn was notable for his 1960s recordings with Booker T. & the M.G. 's and as a session bassist for Stax Records. At Stax, Dunn played on thousands of records including hits by Otis Redding, Sam & Dave, Rufus Thomas, Carla Thomas, William Bell, Eddie Floyd, Johnnie Taylor, Albert King, Elvis Presley and many others. In 1992, he was inducted in the Rock and Roll Hall of Fame as a member of Booker T. & the M.G.'s. Dunn was born in Memphis, Tennessee. His father nicknamed him "Duck" while watching Disney cartoons with him one day. Dunn grew up playing sports and riding his bike with fellow future professional musician Steve Cropper. After Cropper began playing guitar with mutual friend Charlie Freeman, Dunn decided to pick up the bass guitar. Eventually, along with drummer Terry Johnson, the four became "The Royal Spades". The Messick High School group picked up keyboardist Jerry "Smoochy" Smith, singer Ronnie Angel (also known as Stoots), and a budding young horn section in baritone saxophone player Don Nix, tenor saxophone player Charles "Packy" Axton, and trumpeter (and future co-founder of The Memphis Horns) Wayne Jackson. Cropper has noted how the self-taught Dunn started out playing along with records, filling in what he thought should be there. "That's why Duck Dunn's bass lines are very unique", Cropper said, "They're not locked into somebody's schoolbook somewhere". Axton's mother, Estelle, and her brother Jim Stewart owned Satellite Records and signed the band, who had a national hit with "Last Night" in 1961 under their new name "The Mar-Keys". The bassist on "Last Night" was Donald "Duck" Dunn, but he left the Mar-Keys in 1962 to join Ben Branch's big band. Booker T. and the M.G. 's was founded by Steve Cropper and Booker T. Jones in 1962; Al Jackson, Jr. served as the band's drummer. The original bassist, on early hits such as "Green Onions", was Lewie Steinberg; Dunn replaced him in 1964. Stax became known for Jackson's drum sound, the sound of The Memphis Horns, and Duck Dunn's grooves. The MGs and Dunn's bass lines on songs like Otis Redding's "Respect" and "I Can't Turn You Loose", Sam & Dave's "Hold On, I'm Comin'", and Albert King's "Born Under a Bad Sign" influenced musicians everywhere. As an instrumental group, they continued to experiment with McLemore Avenue (their reworking of The Beatles' Abbey Road) and on their final outing, 1971's Melting Pot, which featured basslines that to this day serve as a source of inspiration for hip-hop artists. In the 1970s, Jones and Cropper left Stax, but Dunn and Jackson stayed with the label. He worked with Elvis Presley on his 1973 RCA Album Raised On Rock. In 1971, when rhythm guitarist Tom Fogerty left Creedence Clearwater Revival, the remaining members discussed with Dunn the possibility of his joining the group, with current CCR bassist Stu Cook moving to guitar. However, it was ultimately decided by CCR to remain a trio from that point on. Booker T and the MGs had performed in concert and jammed in the studio with CCR in the past, and Dunn in particular had become good friends with the band members. Dunn went on to play for Muddy Waters, Freddie King, and Jerry Lee Lewis, as well as Eric Clapton and Rod Stewart. He was the featured bass player for Stevie Nicks and Tom Petty's "Stop Draggin' My Heart Around" single from Nicks' 1981 debut solo album Bella Donna, as well as other Petty tracks between 1976 and 1981. He reunited with Cropper as a member of Levon Helm's RCO All Stars and also displayed his quirky Southern humor making two movies with Cropper, former Stax drummer Willie Hall, and Dan Aykroyd, as a member of The Blues Brothers band. Dunn was the bassist in Eric Clapton's band for Clapton's appearance at Live Aid in 1985. Dunn played himself in the 1980 feature The Blues Brothers, where he famously uttered the line, "We had a band powerful enough to turn goat piss into gasoline!" and was frequently shown smoking a pipe whilst playing. He appeared in the 1998 sequel Blues Brothers 2000, once again playing himself. Dunn & the MGs were the house band for Bob Dylan's 30th anniversary in the music business concert at Madison Square Garden playing behind Dylan, George Harrison, Eric Clapton, Tom Petty, Stevie Wonder, Sinéad O'Connor, Eddie Vedder, and Neil Young who recruited the MGs to tour with him and recorded with Dunn several times since. In the 2000s Dunn was in semi-retirement, although he still performed occasionally with Booker T & the MGs at clubs and music festivals. In June 2004, Dunn, Cropper, and Jones served as the house band for Eric Clapton's Crossroads Guitar Festival. The group backed such guitarists as Joe Walsh and David Hidalgo on the main stage at the Cotton Bowl in Dallas, Texas. In 2008, Dunn worked with Australian soul singer Guy Sebastian touring The Memphis Album. Dunn and Steve Cropper arrived in Australia on February 20, 2008, to be Sebastian's backing band for an 18-date concert tour, The Memphis Tour. Dunn is credited with performing on a version of the standard "I Ain't Got Nobody" alongside Booker T Jones, Steve Cropper and Michel Gondry in Michel Gondry's 2008 film Be Kind Rewind. On the morning of May 13, 2012, Dunn died in his sleep after finishing his fifth double show at the Blue Note nightclub in Tokyo with Steve Cropper the night before. He had been in Japan as part of an ongoing tour with Cropper and Eddie Floyd. He is survived by his wife, June; a son, Jeff; and a grandson, Michael. When he was 16, he acquired his first Fender Precision Bass, a 1958 model with sunburst body, one-piece maple neck and gold anodized pickguard, an instrument he owned until his death. During the 1960s, he used a 1959 model, which was identical to his 1958, but with a rosewood fretboard. He was an avid user of thick La Bella flatwound strings, as was James Jamerson. While filming The Blues Brothers, Dunn used a sunburst mid-sixties Fender Precision bass with a rosewood fretboard and a tortoise pickguard. In 1998, Dunn collaborated with Fender to produce a signature Precision Bass, a candy apple red model based on the late 1950s style, with a gold anodized pickguard, a split-coil humbucking pickup and vintage hardware. The Duck Dunn P-Bass became the basis for a Lakland Skyline Series signature bass made by Chicago bass company Lakland a few years later. Dunn used an Ampeg SVT-4PRO head and SVT-810E 8×10 cabinet through his endorsement deal with Ampeg. In 1992, Dunn was inducted into the Rock and Roll Hall of Fame as a member of Booker T & the MG's. In 2007 Dunn and members of Booker T & the MG's (Booker T. Jones, Steve Cropper, Lewie Steinberg and Barbara Jackson, the widow of Al Jackson) were given a Lifetime Achievement Grammy award for their contributions to popular music. ↑ "BBC News Online". Bbc.co.uk. Retrieved May 14, 2012. ↑ Guralnick 1999, p. 139. ↑ Guralnick 1999, p. 155. ↑ Guralnick 1999, p. 158. ↑ Eric Clapton Crossroads Guitar Festival DVD Video R2 970378, 2004. ↑ Patterson, Bryan (February 24, 2008). "Happy Guy Sebastian bares his soul". Herald Sun. Retrieved July 7, 2011. ↑ Nekesa Mumbi Moody. "Bass player Donald 'Duck' Dunn dies in Tokyo". Yahoo! News. Retrieved May 14, 2012. ↑ Wheeler, Brad (May 14, 2012). "With Donald Dunn gone, the bottom falls out of the blues". The Globe and Mail. Retrieved May 15, 2012. ↑ "La Bella Flat Wound Jamerson Electric Bass Strings". GuitarStringDepot. Retrieved May 15, 2012. 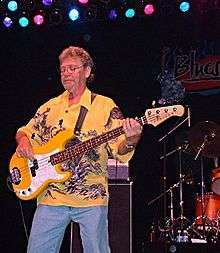 ↑ "Artist Profile — Donald "Duck" Dunn". Ampeg. Retrieved July 7, 2011. ↑ "The Rock and Roll Hall of Fame - 1992 Inductions". Rockhall.com. Retrieved May 15, 2012. ↑ "Bassist Donald 'Duck' Dunn dies at 70". Variety. Retrieved May 14, 2012.